Computer technology has become the backbone of the professional audio world, and local area networks — once the province of nerdy IT people — are now an essential aspect of studio and live sound installations the world over. Audio files are routinely saved to network attached storage (NAS) systems, DAWs are connected to local networks with access to the Internet for software updates, Wi-Fi routers allow remote control via tablets, and stage boxes are increasingly linked to consoles via some form of network protocol. Historically, interconnecting multiple channels of high-quality analogue audio — whether as stage multicores or in a building's wiring infrastructure — has been expensive and cumbersome, involving thick and heavy multicores and costly interconnection panels. Avoiding interference, distortion, noise and crosstalk can be a challenge with point-to-point copper wiring between every source and destination, and it is usually difficult and expensive to modify the wiring once it has been installed. Until recently, audio distribution using local area network technology has mainly been restricted to the live sound arena, with its simpler requirements and obvious benefits in cost and weight. Currently, a plethora of competing proprietary and largely incompatible systems are in use, but the underlying concept makes a lot of sense and is clearly the way forward. The cost of the technology is extremely attractive, the expertise is readily available, and even standard 100Base-T (Cat 5e) wiring can accommodate the bit-accurate transfer of up to 64 audio channels at 44.1/48kHz sample rates. Using the more evolved protocols, network switches and patch panels can distribute the data very flexibly, too, so that changes or extensions to the audio network become simple and cost-efficient to implement. However, high-quality audio-over-Ethernet is demanding in terms of signal quality, network latency and synchronisation. Data-throughput delays in standard IP networks can be highly variable, so special (usually proprietary) techniques have to be employed to guarantee that data sent to different destinations arrives at the appropriate time. The rear of the RedNets, with RedNet 1 at the top and RedNet 5 at the bottom. Focusrite have been working hard over the last year or so to develop a range of products that harness the advantages of audio networking in ways that are appropriate to studio applications, and the RedNet system is the first designed exclusively for studio applications. Rather than developing their own proprietary format, though, Focusrite have — very sensibly, in my view — employed the thoroughly proven Dante interface developed by Audinate in Australia. Dante was the first fully-compliant layer-3 audio-over-Ethernet system, designed to deliver bit-accurate digital audio (or video) with imperceptible latency and accurate synchronisation. A 100Mb/s network can accommodate 48 bi-directional channels of 24-bit, 48kHz audio (or 24 channels at 96kHz), while a Gigabit network — which is the format Focusrite have adopted — can accommodate up to 512 bi-directional 48kHz channels (256 at 96kHz). The total system latency is dependent on the complexity of the network, but is fixed once the network is established and is typically between 150us and 500us — yes, that's microseconds! The Dante technology has already been adopted by a significant number of pro-audio manufacturers including Allen & Heath, DiGiCo, Dolby, Dynacord, Electrovoice, JoeCo, Lab.Gruppen, Lake Processing, Lectrosonics, MC2 Audio, NTP technology, Peavey, Symetrix, Telex, Turbosound, XTA, Yamaha and, of course, Focusrite. Significantly, Audinate have made it clear that Dante will be fully 'AVB-compliant' when this international standard is finally ratified by the IEEE, guaranteeing long-term future compatibility. Audinate's Dante Controller software provides a matrix view for setting up more complex routings. The full RedNet system comprises seven different interface products. I was supplied with the first four interfaces plus the RedNet PCIe card, all hot from the factory, and I'm told the other two products are due for release imminently (see the 'RedNet 5 & 6' box). Together, these form a scalable, expandable audio networking system with traditional Focusrite sound and build quality, all the usual interface options, attractive pricing, and future-proof technology. All six hardware interface units share a common aesthetic, marking a welcome return to the fabulously red, chunky, milled-aluminium face plates we all remember from the coveted Red-series mic preamps, equalisers and compressors. The central portion of each unit carries a black panel hosting arrays of LED indicators and meters appropriate to each specific interface, while a new thumb-switch on the right hand side powers the unit. As you can see from the pictures, these interfaces exude quality and elegance. RedNet 1 and RedNet 2 are no-frills line-level A-D and D-A converters, the former being an eight-channel device, while the latter caters for 16 channels. Both are housed in a 2U rack chassis, with all the I/O on the rear panel. Analogue interfacing is via the (new) AES59 standard connector (don't panic — it's a very familiar interface under a new name: see the 'AES59 Interface' box). Also on the back are the usual IEC mains inlet (100-240V AC) and an RJ45 socket for the Dante network connection. Configuration is performed remotely over the network via the RedNet Control software application, with options to set the sample rate (44.1, 48, 88.2, 96 and 192kHz), clocking (internal or from the assigned network master device), and analogue reference levels (+18 or +24dBu for 0dBFS). The configuration status is reflected on each hardware unit's front-panel LEDs. Technical performance is very good, with an AES17 dynamic-range figure of 119dB A-weighted, THD+N distortion easily below 0.001 percent, and crosstalk between channels comfortably under -90dB. The front-panel metering is basic but informative, with a single LED for each channel showing green when the signal level exceeds -42dBFS, orange above -6dBFS, and red when overloaded. The RedNet Control software is your window into the inner workings of RedNet and allows you, amongst other things, to configure the peak level and switch off the hardware unit's cooling fan, should you need to.RedNet 3 is a 32-channel digital interface, again housed in a 2U rack chassis. Alongside the IEC universal mains inlet and Dante network socket, the unit is equipped with word-clock in and out on BNCs, S/PDIF in and out on a pair of RCA-phono sockets, AES3 via an AES59 connector, and eight pairs of ADAT lightpipe connectors. The ADAT ports can access all 32 channels in and out at sample rates up to 96kHz (using S-MUX2), and 16 channels at 192 (with S-MUX4). At base sample rates, the ADAT inputs 5-8 are disabled, and outputs 5-8 duplicate outputs 1-4. Eight channels in and out can be routed via AES3 (in place of one ADAT port), and two channels via S/PDIF (the latter replacing an AES3 channel when in use). The final hardware unit supplied for review was the RedNet 4 eight-channel remote-controlled mic preamp and A-D interface. The preamps are the same design as those employed in the company's Forte USB interface, based on the classic ISA preamp technology. Rear-panel connectivity comprises an IEC universal mains inlet, Dante Ethernet port, eight mic input XLRs, and an AES59 D-sub for analogue line-level inputs, while the front panel also sports two high-impedance instrument inputs. 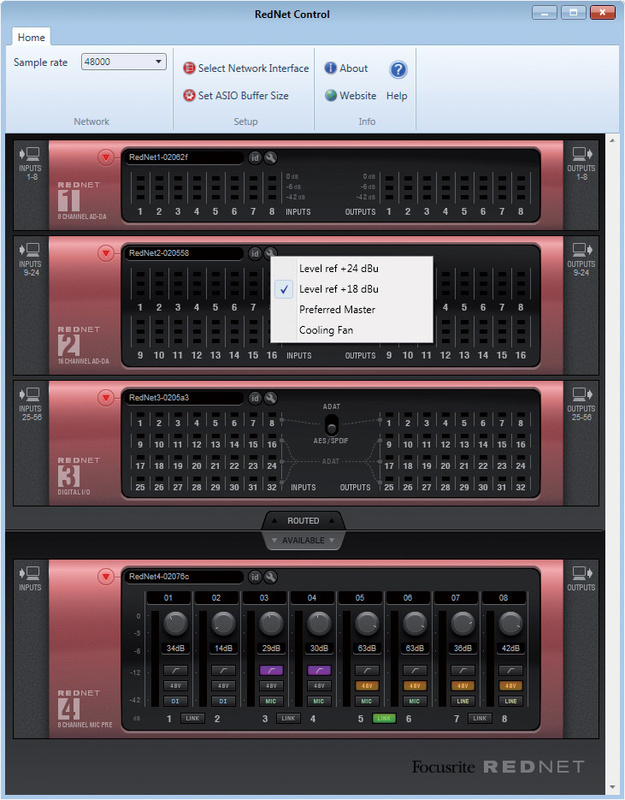 Input signal conditioning facilities (mic/line/DI selection, gain, phantom power and high-pass filter) can be configured over the network from the RedNet software application, but the RedNet 4 differs from the other units in the range by also having front-panel controls to allow local configuration. The unit's line-level performance doesn't quite match that of the RedNet 1 and 2 interfaces, with an AES17 dynamic range figure of 117dB (A-weighted), but it is still very good given the additional flexibility of its variable sensitivity (-30 to +24dBu for 0dBFS output). The mic preamp's gain range is 8-63dB in 1dB increments, and it is able to achieve a 0dBFS output with input levels spanning -47dBu to +16dBu. In more practical terms, allowing a more sensible headroom margin, the Rednet 4 preamps can accommodate mic outputs down to about -65dBu or so without difficulty. The Effective Input Noise (EIN) figure is -128dB (with a standard 150 Ohm source and 60dB gain). The instrument input can accommodate input levels between -44 and +10dBu (for a 0dBFS output), and I suspect that the gain control will be set at minimum for most guitars and basses. The switchable high-pass filter option is a second-order design (12dB/octave), reaching -6dB at 65Hz, and the channel metering is a little more elaborate than the RedNet 1 and 2 units, with three separate LEDs on each channel for the three level thresholds (instead of the single tri-colour LED employed in the line-level converters). 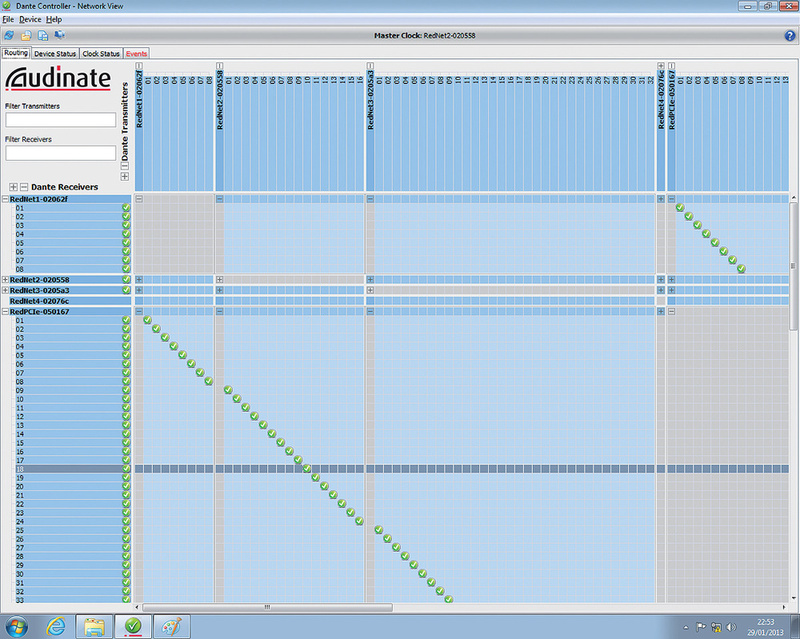 Again, the LED thresholds are -42dBFS (green), -6dBFS (yellow), and overload (red). A colour OLED display and associated encoder knob and configuration buttons on the right-hand side of the black panel can be assigned to indicate and control any input channel if the push-button under each channel's LED meter is pressed. Three push-buttons are provided, for changing the input source, the phantom power, and the high-pass filter setting, all with associated status LEDs. The OLED screen shows the selected channel number (which changes colour to reflect the selected input mode: green for mic input, yellow for line, and blue for DI), as well as the current channel gain, which is adjusted using the encoder knob below the display. There are three ways of tying a RedNet Dante audio network into a DAW computer. Pro Tools HDX, HD (TDM), and HD Native users can use the RedNet 5 interface to hook the audio network directly into Pro Tools PCIe cards. For DAW applications using ASIO- or Core Audio-based interfaces — in other words, all the usual suspects, including Logic, Cubase, Nuendo, Reaper and so on — Focusrite's own RedNet PCIe card provides the optimal interface, handling up to 128 channels at 96kHz and with around 3ms round-trip latency. The third alternative — albeit with slightly greater latency akin, to a typical Firewire interface — is to use Audinate's own DVS software (short for 'Dante Virtual Soundcard') to handle audio data connected via the computer's own Ethernet port. A single DVS license comes free with each RedNet I/O device, and additional licenses can be purchased from Audinate. Both the RedNet card and the DVS software are compatible with both Mac (OS 10.7 and later) and PC (Win 7 or later, 32- and 64-bit) platforms. Whichever method is used to integrate the RedNet audio network with the computer, all of the interfaces are configured and controlled using the supplied RedNet Control application. This is a very straightforward program in which the various configuration options are adjusted by clicking on the appropriate on-screen buttons for each detected unit (the current status, including metering, of each unit is reflected in the on-screen graphics at all times). A drag-and-drop paradigm is used to assign I/O channels intelligently, in consecutive groups, to each unit. You simply drag the connected units from the 'available' list to the 'routed' list, their order within the 'routed' stack determining the assigned I/O channel. So, for example, if the rack was arranged with a RedNet 4 at the top, followed by a RedNet 2 and then a RedNet 3, channels one to eight would be assigned to the RedNet 4 preamp, channels 9-24 to the 16-channel RedNet 2 converter, and channels 25-56 to the 32-channel RedNet 3 digital interface. More complex routing arrangements can be accommodated by running the supplied Audinate 'Dante Controller' application which provides a matrix-style window whereby any input (Dante Transmitters) can be assigned to feed any output(s) (Dante Receivers). It's also worth noting that the system supports multiple hosts, so you can have, for example, one computer accessing the network via a RedNet PCIe card, one using the Audinate DVS application, and a Pro Tools rig hooked up via a RedNet 5 interface. Audio can be routed between the different computers and they can also access any I/O anywhere on the network, all at the same time. In addition to the first four RedNet hardware interfaces, the review system also included a host PC — complete with a pre-installed copy of Nuendo, and a RedNet PCIe card (plus the associated RedNet Control and Dante Controller software) — and a Cisco managed Gigabit switch. This last acts as the audio network hub, to which all RedNet interfaces and the host computer are connected, using Cat 5e or Cat 6 Ethernet cables (up to a total cable length of 100 metres is permitted between devices). The switch has to be configured carefully to handle the audio data packets correctly — which is what the 'managed' description is all about — and basically it involves prioritising the time-critical clock synchronisation data first, the audio packets second, and any other network traffic (such as the hardware configuration commands) last. Detailed configuration information, and information on which switches are compatible, is available on the Focusrite web site. There is also some helpful advice about optimising Macs and PCs for low-latency audio applications. Each RedNet hardware interface is connected to the switch with a single Ethernet cable and, where a RedNet PCIe card is used as the host computer audio interface, it is also connected via a signal Ethernet cable. In addition, a second Ethernet cable needs to be connected from the computer's own network port to the switch to convey hardware configuration commands from the RedNet Control software. With everything up and running, the allocation of Dante network I/O channels between the various RedNet interfaces is configured using the RedNet or Dante control applications (previous session settings are retained, of course), while the allocation of RedNet channels to the DAW's specific inputs and outputs is set up in the usual way within the DAW. With that done, audio can be recorded and monitored via the appointed connections with negligible latency and excellent quality. In fact, the RedNet system itself becomes a transparent pipeline that is quickly forgotten — it is that simple and reliable. The quality of the converters is well up to the expected Focusrite standards and essentially beyond reproach, and the ability to configure the peak level for either +18 or +24dBu systems is a useful feature. The mic preamps perform very well, too, and the network-cabled format makes it convenient and practical to locate the preamps near the mics in the studio — avoiding the need for long analogue cables between rooms! When they're used in this way, the inclusion of hardware controls for channel gains and so on makes it easy to set an initial configuration in the studio, and then fine-tune it remotely from the control room if necessary. Being picky for a moment, most of the hardware units are fitted with a cooling fan that appears to be switched on by default and generates audible acoustic noise. However, these fans can be turned off via the RedNet Control application and the manuals state that the units are adequately cooled by passive convection, provided the side ventilation slots are kept clear and the ambient temperature is below 30 degrees C.
The RedNet audio networking system is built upon well-proven and widely-supported technology, and is compatible with a wide range of other manufacturer's Dante-compatible equipment. The analogue and digital interfaces tested here all performed extremely well on a technical level, and the aesthetics appeal enormously, too. Overall, this is a well thought-out and nicely implemented system that is both expandable and extremely flexible, has minimal latency and excellent audio fidelity, and is future-proof via compliance with the proposed AVB standard. It offers a very attractive solution for 21st-century studios that need to connect large numbers of I/O channels with maximum flexibility and convenience, but moderate cost. Impressive. 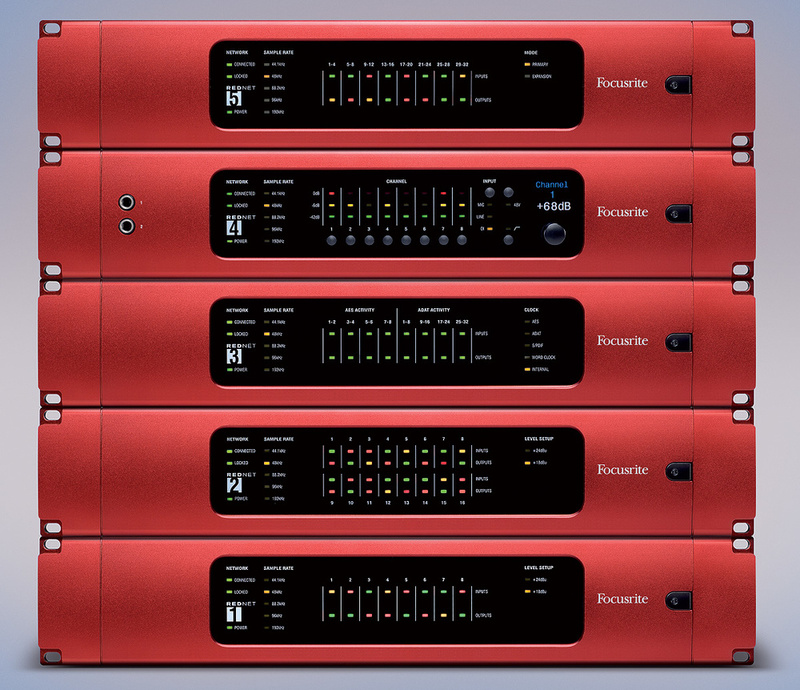 While the Dante system has been widely adopted in the live sound arena, Focusrite's RedNet version is the first studio-orientated implementation, and thus has no direct competition. Most audio-over-Ethernet systems can be placed into one of three categories, defined by the complexity of the protocols employed. The simplest approach, called 'physical' or 'Layer 1' systems, include Aviom's A-net, the AES50 (superMAC) standard, and Riedel's Rocket system. These use standard Ethernet cabling and connectors but the bespoke 'media access control' protocols they use aren't compatible with conventional IP Ethernet systems. As a result, they require dedicated and completely independent network infrastructures which can only carry the audio data. In general, these systems are wired point-to-point, connecting a stage box directly to a console using a dedicated Cat-5 cable, for example. Moving up a level in complexity and compatibility, 'Data Link' or 'Layer 2' systems wrap the digital audio data into standard Ethernet data packets, which means they can operate within standard Ethernet networks (although dedicated audio-only networks may still be required to guarantee stable latencies and data capacities). Layer 2 systems include the AES51 format, Allen & Heath's ACE, Calrec's Hydra system, CobraNet, Digigram's Ethersound, and Roland's REAC format. Data can be routed and distributed through standard Ethernet switches, if necessary, allowing greater transmission path lengths and more flexible installation options. Full 'Network' or 'Layer 3' systems comply totally with all IP standards and so are completely compatible with all standard networking systems (although most cannot be used over the Internet). The Institute of Electrical and Electronics Engineers (IEEE) is working on international standards for the transport of audio and video over Ethernet within the layer 3 protocol, under the 'AVB' group, and this will probably become the 'industry standard' format in the near future. Current Layer 3 systems include ALC NetworX's Ravenna, Audinate's Dante, QSC Audio's Q-LAN, and Telos Axia's LiveWire. The most common multi-channel analogue interface format, for a decade or more, has been the Tascam standard, using 25-pin D-sub connectors to carry eight balanced audio signals. A related variation, equally widely adopted, also conveys four AES3 digital connections in each direction (providing an eight-channel digital I/O). Recognising the ubiquity of these interfaces, the Audio Engineering Society has, at last, formalised their use with the release, last year, of the AES59 standard. Not only does this international standard enshrine the pin-out arrangements and the connector sexes required on equipment (female) and cables (male), it also endorses the use of 4/40 UNC threaded jackscrews to secure the connectors in place. This matters, because some implementations have used incompatible M3 threaded jackscrews, which can be highly frustrating! The ubiquity of Pro Tools HD in the pro-audio world is such that Focusrite have developed a bespoke bridging interface to allow audio to be exchanged between Pro Tools and a RedNet network. 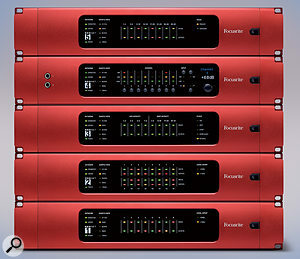 Up to six 32-channel RedNet 5 I/O units can be hooked up to a single Pro Tools HDX system to access the DAW's maximum of 192 channels at 96kHz. 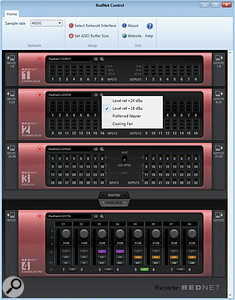 Pro Tools HD Native and HD (TDM) systems are also supported, and RedNet 5 interfaces are fully compatible with other standard Pro Tools interfaces. The RedNet 5's rear panel carries word clock and loop-sync in-out BNC connectors, as well as primary and expansion DigiLink multipin connectors, in addition to the standard Dante and IEC sockets. The one 'standard' interface format not yet mentioned in my description of the RedNet hardware range is AES10 — which is better known as MADI — but fear not; this is catered for by the slimline, 1U-cased RedNet 6 interface. The RedNet 6 acts as a bridge for all 64 bi-directional channels carried in a standard MADI-X stream, and provides both coaxial and optical connection options. Asynchronous sample-rate converters are incorporated on every input and output, so that the MADI and RedNet systems can be operated at independent sample rates, although word clock in and out is also provided on BNC connectors for synchronisation, where necessary. Hugely versatile, configurable and expandable audio network system. Analogue line, ADAT, AES3, MADI, mic/DI and Pro Tools interfaces available. Who doesn't love those thick red faceplates? Future-proof, thanks to the IEEE standard AVB compatibility. Care needed in optimising network switch priorities. Potential for acoustic noise if fan cooling is required. A 21st-century solution for connecting large numbers of I/O channels in a DAW-based studio. Based on well proven, widely supported and future-proof technology, the RedNet audio network system is immensely versatile and configurable, and works extremely well. Focusrite Novation Inc +1 (310) 322-5500.